So, the Greek referendum is today. Here’s hoping that it forces some progress in the endless madness that is the Greek crisis. Because so far the Troika has simply been demanding the same things, in the same terms, for years. Is it even a “crisis” when nothing changes for that long? 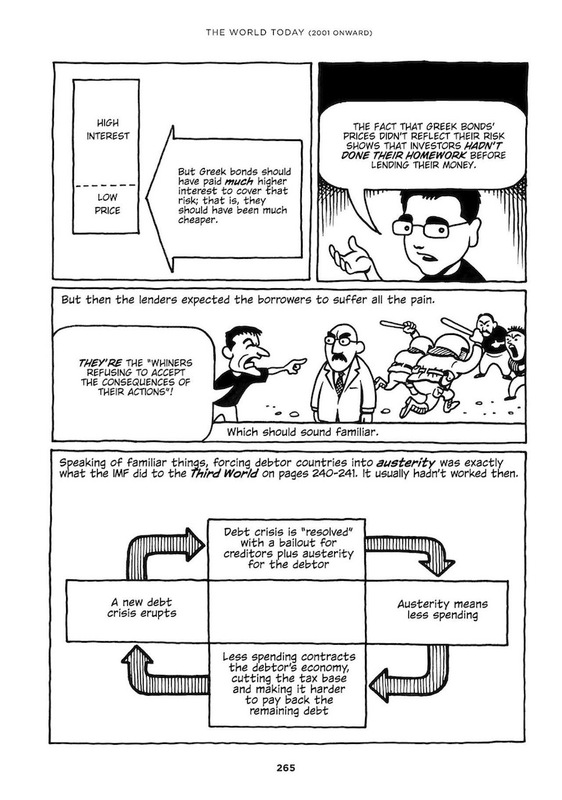 Seriously, check out what I wrote about Greece in Economix, keeping in mind that the text was finished in mid-2011. I would write the same thing word for word today. That’s been the situation for the last four years and more. But maybe not tomorrow. EDIT, 7/5/2015: When I wrote this I was confused by the holiday and thought it was already Sunday. Derp. I admit not knowing all details, but what about the misinformation provided by the Greek government(s)? 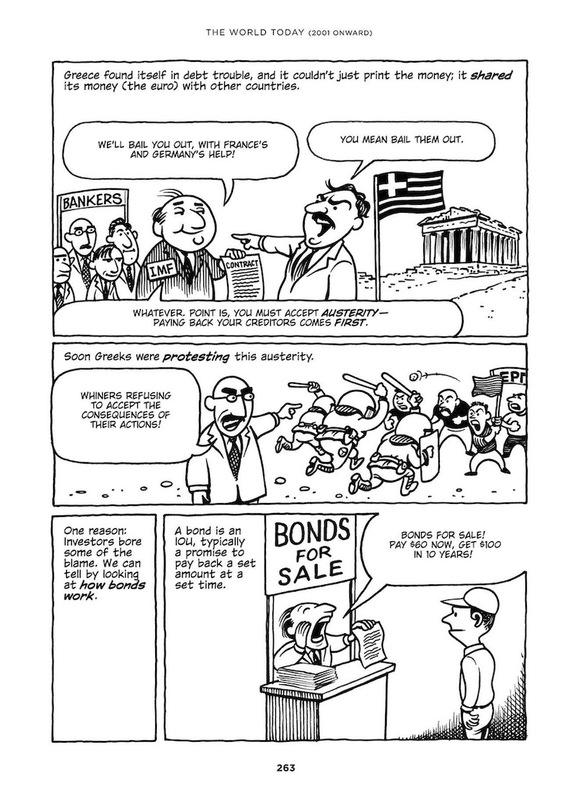 I’m not denying the underlying point of the cartoon, but could’nt the fact that deliberate misinformation was provided by the Greeks have had an impact on the assesment of the Greek state bonds? The Greek government definitely deserves a lot of blame here; it was stupid and improvident, and it lied about its condition. But at least some of these problems should have been obvious to anyone who did even the slightest bit of homework. The principle we have to answer, Lars, is this: If I lend you money and can’t get it back, is it my fault or yours? More deeply, what rights do I have to force you to pay up? Can I kick you out of my neighborhood? Can I get the cops to garnish your wages? 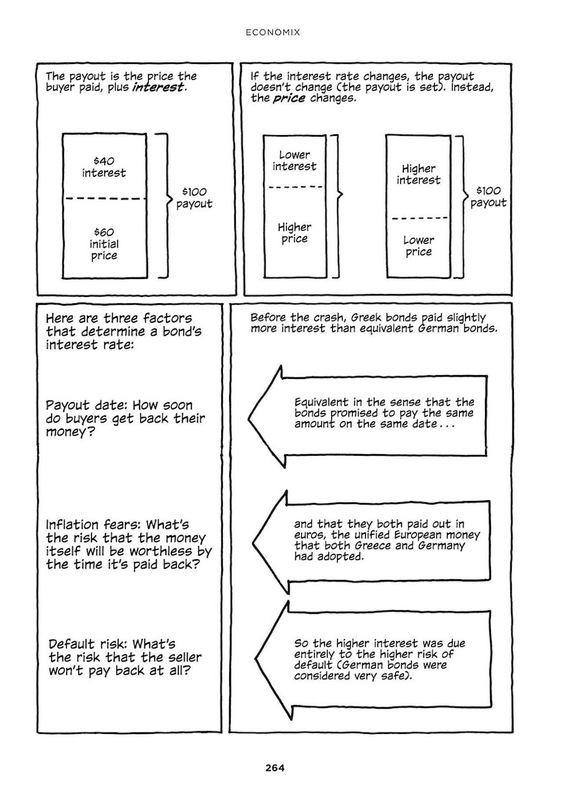 The very POINT of interest is that there’s risk (as well as the fact that lending money is an opportunity cost). So what we see, routinely, is that people lend at high interest than get the state to enforce debt payments. That leads to people not being that scared to lend riskily… which is a VERY BAD thing. Again, we are seeing the message that we need to have austerity and responsibility for the poor while the rich always get bailed out. It’s not a good economy even for the rich, but it’s actually very bad for the poor. When will rich lenders have to face the discipline of the market? Congratulations for your work, the issue with Greek and the EU failures are passed in brief, that’s OK I guess for planning and space considerations. BUT it comes as a really unpleasant surprise, the fact that in your references and/or further reading section you fail to mention the work of many modern economists on the subject which elucidate the subject and actually strongly support your overall argumentation. One such erudite professor, with claim to fame after his political involvement, is of course Yanis Varoufakis. I am sure you will find interesting material there. I make this comment with the sincere hope of positive and constructive criticism as I am sure it will help you in improving your reference list and add value, overall, to your book and blog. I do not care of seeing my comment posted as long as it serves you and your noble purpose. Thanks again keep up the good work. You have my every good wish. Yanis is great! I think we also have to add in the issue of the fact that Germany never paid war reparations to Greece. The assertion that it was settled in any kind of justice is I think totally fraudulent.